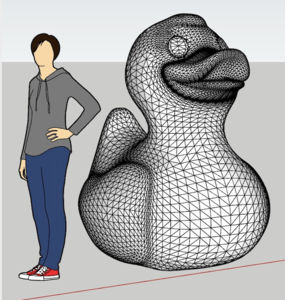 Westport, CT – An attempt to set a record for the world’s largest 3D printed duck at the 8th annual Maker Faire Westport (http://westport.makerfaire.com) on Saturday, April 27, 2019 has been announced. It’s called The Great Duck Project. The initiative was first envisioned by Mark Mathias, founder and president of Remarkable STEAM, Inc., and is a collaboration of the Westport Sunrise Rotary Club and Greens Farms Academy in Westport, Connecticut. The Great Duck Project is a first of its kind global crowdsourcing science and art initiative that allows people from around the world to 3D print and submit pieces that will become part of a six-foot-tall, 476-piece duck. “No one has ever tried to print a six-foot-tall duck before,” said Mark Mathias, the person who came up with the idea. “By reaching out to every continent on the globe for contributors to engage people of all ages in a collaborative way provides a unique opportunity to showcase what is possible when people work together towards a unified goal,” he added. “We are honored that Greens Farms Academy is the technical lead for the project,” said Bob Whelan, GFA's Head of School. “It’s a perfect example of creativity, innovation, and collaboration for our students and faculty. This is boundary- breaking work,” he added. People who want to “Be a Part of the Duck” should go to http://thegreatduckproject.org and sign up. They fill out a form and will be emailed a file containing a specific duck part that can be printed on a 3D printer. 3D printers are generally available in libraries, schools, offices and even homes. When the duck part has been printed, it will be mailed to Greens Farms Academy to arrive by April 1, 2019, where the parts will undergo quality assurance before being put into the inventory for the duck build at Maker Faire Westport on Saturday, April 27, 2019. Remarkable STEAM is the leading Connecticut organization that promotes innovation and creativity in the areas of STEAM (Science, Technology, Engineering, Arts and Math). It focuses on support for education and job creation. Remarkable STEAM is a 501(c)(3) not-for-profit corporation. Its leadership team founded and through generous community support, finances Maker Faire Westport and supports similar initiatives. It is creating “maker” events and facilities where people can improve their lives and communities. Westport Sunrise Rotary is one of over 34,000 Rotary clubs around the world. Members of Westport Sunrise Rotary fulfill the club motto “Service Above Self” through hands-on community activities, youth leadership, and fundraising for local, national and international charitable works. The club’s 11th annual Great Duck Race will be held on June 1, 2019 in downtown Westport. Westport Sunrise Rotary meets every Friday morning at 7:30am at the Westport Inn. Visitors are welcome. A PreK-12 co-ed day school in Westport, GFA engages students as partners in an innovative, inclusive, and globally minded community to prepare them for a life of purpose. For more information: www.gfacademy.org. The original Maker Faire event was held in San Mateo, CA and in 2017 celebrated its twelfth annual show with some 1200 makers and 125,000 people in attendance. World Maker Faire New York, the other flagship event, has grown in six years to 900+ makers and 95,000 attendees. Forty larger scale Maker Faires occur in cities around the world—Berlin, Paris, Rome, Tokyo, and Shenzhen to name a few—and over 220 community-driven, independently organized Mini Maker Faires are now being produced in the United States and in 43 other countries around the world.